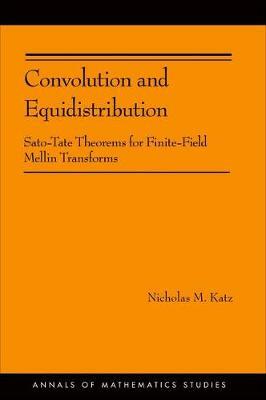 Convolution and Equidistribution explores an important aspect of number theory--the theory of exponential sums over finite fields and their Mellin transforms--from a new, categorical point of view. The book presents fundamentally important results and a plethora of examples, opening up new directions in the subject. The finite-field Mellin transform (of a function on the multiplicative group of a finite field) is defined by summing that function against variable multiplicative characters. The basic question considered in the book is how the values of the Mellin transform are distributed (in a probabilistic sense), in cases where the input function is suitably algebro-geometric. This question is answered by the book's main theorem, using a mixture of geometric, categorical, and group-theoretic methods. By providing a new framework for studying Mellin transforms over finite fields, this book opens up a new way for researchers to further explore the subject.